Do you need help on scalp acne medication? Well, while the problem may have frustrated your efforts, there are methods that have been proven to eliminate these pesky pimples. 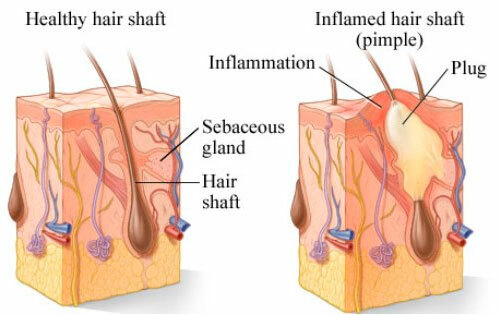 Unlike chest acne, the healing process of scalp acne is complex due to the presence of hair on the scalp. Nevertheless, adequate measures are readily available to boost your fight against their occurrence. Read through this article to learn the causes, medication to use, as well as the best shampoos on the market that eradicate the acne within few days! These acne are caused by blockage of skin pores which can be occasioned by numerous factors including dirt and oil. The clogging causes the inflammation of the hair follicle which can result in a bacterial infection if you’re not quick to clear it. The scalp acne is common in people with overly oily skins since the oil produced, if not adequately cleaned, traps dust and dirt particles resulting in the blockage. As such, it’s highly crucial that you know your skin type to learn about the acne prevention tactics. If you have an oily face, you should ensure that you regularly clean your face to prevent the accumulation of the oil on the skin surface. To get exhaustive information on acne, visit what causes acne. Hormonal factors. You will be at a higher risk of developing the scalp acne if you are at a stage prone to hormonal disturbances including adolescence, pregnancy, menopausal stage, and menstruation. The hormonal variations trigger your sebaceous glands to produce large amounts of oils which increases the chances of developing scalp acne. Also, factors such as stress and medications raise the possibility of developing the pimples. The medications that can result in hormonal imbalance include family planning pills and any other estrogen or androgen based product. Environmental Factors. It is highly likely that you’ll have a problem with acne if you spend most of your time in a dirty environment. You should always ensure that all the headgears that you wear are clean to minimize the chances of acne emergence. Hair Care Products. Your scalp is highly sensitive and you should only apply products that do not trigger an allergic reaction on your skin. Most of the hair products are greasy and tend to block the skin pores which consequently results in the emergence of pimples. As such, you should be extremely cautious when applying oil, gels, dyes, hair conditioners, and any other product on your scalp. The helmets, hats, and other headgears increase sweating leading to itchiness and a feeling of scratching the scalp which consequently leads to pimples. You should, therefore, clean these items regularly. Scalp acne causes immense discomfort and you’re undoubtedly looking for means to get rid of them. Right? The initial acne treatment therapy involves hygiene. While acne has myriad causes, cleanliness is a fundamental factor that you should not overlook when designing an acne eradication plan. Never Overlook the Role of Hygiene in Acne Management! You should ensure that you regularly clean your scalp with plenty of water and friendly soaps and shampoos. When you achieve this, you eliminate any chance of continued blockage of the skin pores which makes the healing process easier. All your headgears including the helmets and the hats should be cleaned regularly which guarantees a clean environment around your scalp. Other products that you may use are as described below. The clogging of the skin pores on your scalp creates an ideal environment for the multiplication of bacteria. As such, the use of antibiotics is one of the primary acne medication methods aimed at eradicating all the bacteria that may have compounded your acne problem. While you can easily access some of these products over the counter, it’s necessary that you get an expert opinion on the best antibiotic for use on your condition. These products are prescribed by your doctor depending on your condition. You should note that different bacteria species react differently to the specific antibiotics and you, therefore, require a qualified dermatologist acne examination. The antibiotics come in different formulations including pills, gels, and creams to ensure that you use the most convenient options. However, your doctor may recommend that you use a product that is only available in a specific formulation. Mupirocin is, for example, commonly used but is largely available in gel and cream formulations. There are several over the counter products that you may consider for the treatment of the scalp acne. It is, however, critical to ensure that you only apply those products that you are certain about to avoid complications that may arise from allergic reactions. While over the counter medications are readily accessible and save you the hassle of visiting your dermatologist, you shouldn’t rush to use them! Instead, you should evaluate the product to determine its applicability to your situation. Assess whether you have had severe side effects to the specific molecules in the past. If in doubt, avoid self-medication since it can worsen the situation for you! Antibiotic Creams. There are several creams and ointments that you can apply on the scalp. 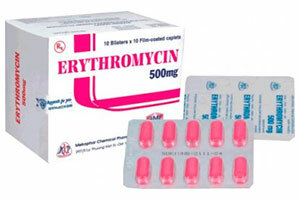 The primarily used antibiotic is mupirocin which you can easily obtain from your nearest pharmacy. Antibacterial Soaps. There are numerous brands of soap products that have been enriched with substances that can adequately inhibit the growth of microorganisms. You should use such products whenever you clean the scalp. Shampoos. You can obtain both medicated and non-medicated shampoos over the counter to use when washing your scalp. These shampoos prevent excessive itchiness which would otherwise prolong the healing process. Also, some of the products have antibacterial, astringent, and other healing properties to ensure a quickened healing process. Other Creams. There are other products that you can apply on your scalp including benzoyl peroxide lotion, salicylic acid, alpha hydroxyl acid, and sulfur soaps. The best acne treatment is the use of antibiotic therapy. This treatment has received the endorsement of many dermatologists due to its efficacy and reliability in reducing the severity of the symptoms, healing the acne, and preventing scarring after the healing process. The experts recommend a combination of both oral and topical antibiotics whereby, the patient completes their oral antibiotic dosage and continues with topical application for complete healing process. If you are having severe acne that won’t disappear despite your effort to fight them, then it’s time to consider adopting this therapy. There are numerous shampoos that help in the management of scalp acne. AcneZap Shampoo. This product has natural components that help in drying the skin thus preventing advancement of the acne. Also, it has superb anti-bacterial and anti-inflammatory properties. Gylcolix Shampoo. The product removes the excess oil from the scalp as well as the dead skins which allows enough air to the healing acne thus enhancing the process. Keeva Organics Shampoo. This product comes in different formulations of tea tree, argon, and coconut oil. The product is organic and works best to exfoliate the skin, moisturize it, and prevent the growth of bacteria. Sea Breeze Astringent Shampoo. The product prevents the buildup of oil which consequently prevents acne and accelerates the healing process for individuals suffering from acne. Neutrogena T/Sal Shampoo. The product includes salicylic acid which offers a brilliant remedy for acne. It ensures a quick healing process and prevents scarring. 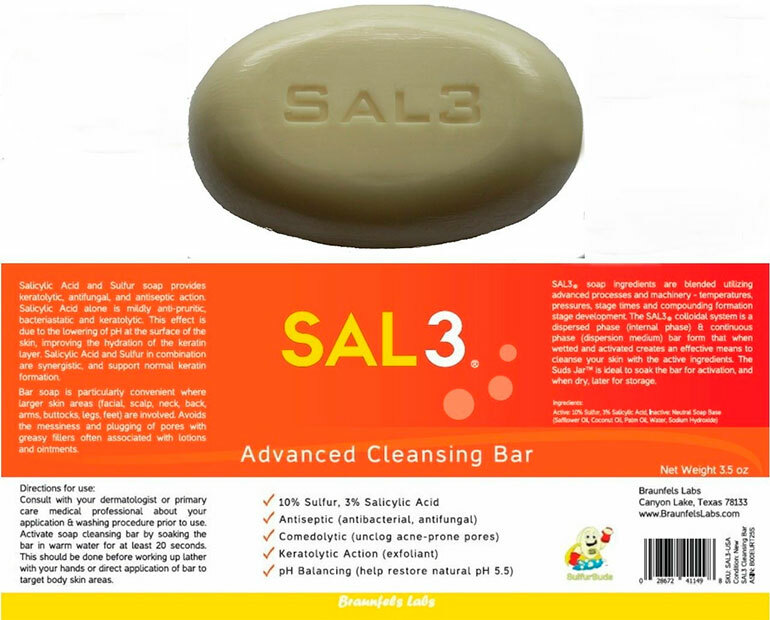 Sal3 Shampoo. This product is made out of salicylic acid and sulfur which creates a synergy to eradicate acne within some few days! Also, it combats the dandruff menace and unclogs the skin pores which enhances the healing process. ANTI-b Antibacterial Shampoo. The product combines lemon essential oils, witch hazel, Aloe Vera, and Cutipure CLR. It fights bacterial infections, inflammation, and ensure a scarring-free healing process. Maple Holistics Tea Tree Oil Shampoo. The product is designed to ensure that the pores of your scalp remain open thus eliminating chances of emergence of fresh acne. Also, it fights dandruff and bacteria which guarantee a quick healing process. Seborrheic Dermatitis Shampoo and Conditioner Set. This product is designed to prevent flare-ups thus healing the acne and inflammation within the shortest time. It restores the natural skin acidity and moisturizes your scalp. Differin Adapalene Gel. This is a retinoid-based product that restores the integrity of your scalp within few days of application. It guarantees a scarring-free healing process due to its strong astringent properties. Ovante Natural Shampoo. The product is made from herbal extracts and other natural substances that have the potential to kill and eliminate bacteria and fungi. When you apply this product, your scalp recovers from the acne within a few days of application. Honeydew Volumizing Shampoo. This product is made out of natural products to prevent hair loss during the recovery period. Also, the product contains astringent properties that ensure a spot free face. Read about best acne spot treatment. OM Botanical Organic Antifungal Shampoo. This product possesses crucial antimicrobial properties which hastens the healing process of the scalp acne. Also, it has astringent properties ideal to ensure that you don’t lose the smooth texture of your skin. Treating scalp acne can be painful due to the complications associated with hair on the scalp. If you’ve tried everything possible to no avail, you shouldn’t worry! Read through this guide to get the most relevant tips to apply to your situation.